Let's build horrible toys! Christmas is coming, and the gifts are grotesque! 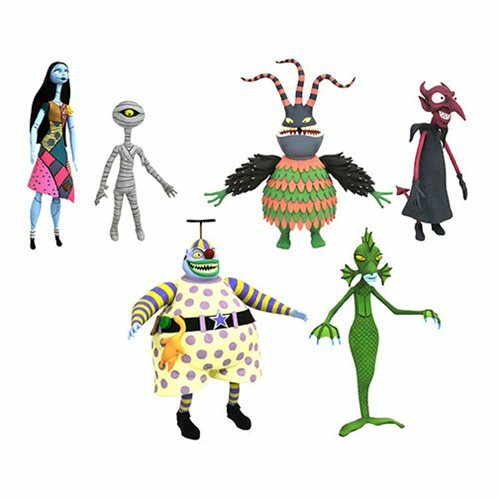 The hit Nightmare Before Christmas action figure line from continues with a sixth assortment, featuringcharacters and accessories. Three different multi-packs make up the series, including Sally with the Mummy Boy and Hanging Tree, the Clown with the Undersea Gal and her tank, and the Harlequin with the Devil and another piece of the gift-making table - combine it with the pieces from Series 5 (sold separately) to form a larger diorama! Each set comes packaged in display-ready Select packaging with side-panel artwork.